JACKSON, Miss. – Despite a strong fourth-quarter offensive performance, the LeTourneau University women’s basketball team was unable to come back from an early deficit in a 69-51 loss to Millsaps College on Sunday, November 25. LETU is now 1-3 overall heading into American Southwest Conference play while the victory moves the Majors to 4-1 overall. LETU saw offensive struggles early on as they were only able to put five points on the board during the first ten minutes of play, missing 14 of their first 16 shots from the field. Entering the second quarter with a 15-5 lead, Millsaps continued to put pressure on the YellowJackets by using an 8-2 run to start the quarter to take a 23-7 lead with 7:50 left in the quarter. LeTourneau would then use an 8-0 run coming from a trio of YellowJackets to cut the deficit back to the original at the start of the second period while looking to grab momentum heading into the final minutes of the first half. Hoping to keep their run going, the LETU saw the turnover bug catch them down the stretch which allowed the Majors to claim a 33-20 halftime lead. Millsaps came out of the locker room strong to start the second half, scoring the first nine points of the third quarter to put LETU in a 40-21 hole 2:08 into the period. Managing to prevent things from getting any worse, LeTourneau would manage to hold Millsaps to just three points in the final six-plus minutes of the third quarter while scoring the final three points to trail 49-29 after 30 minutes of play. 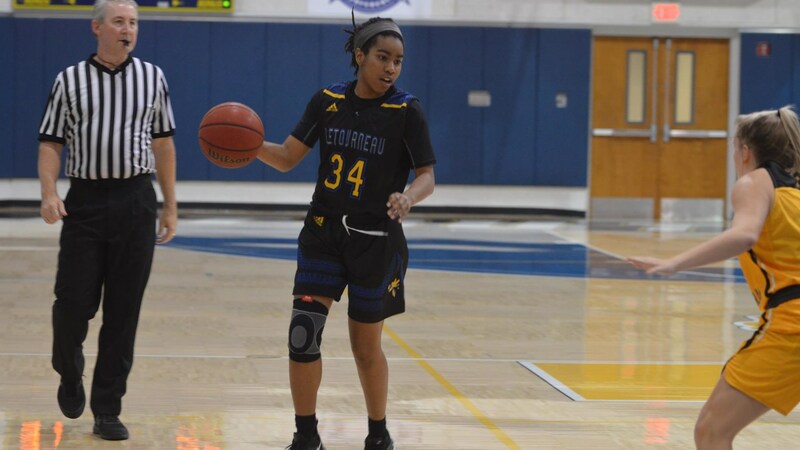 The fourth quarter would prove to be the YellowJackets strongest of the game as senior Jalia Leaven sank a trio of shots from behind the arc to pull LETU within nine at 55-46 with 4:21 remaining. Despite the strong start to the quarter, the late-game effort wound up falling short as a 14-5 scoring advantage to close out the game for Millsaps allowed the Majors earn a victory in the first of two meetings this season between the two squads. Leaven was the only YellowJacket to reach double-digits as she led LETU with a season-high 17 points with 15 points coming from three. 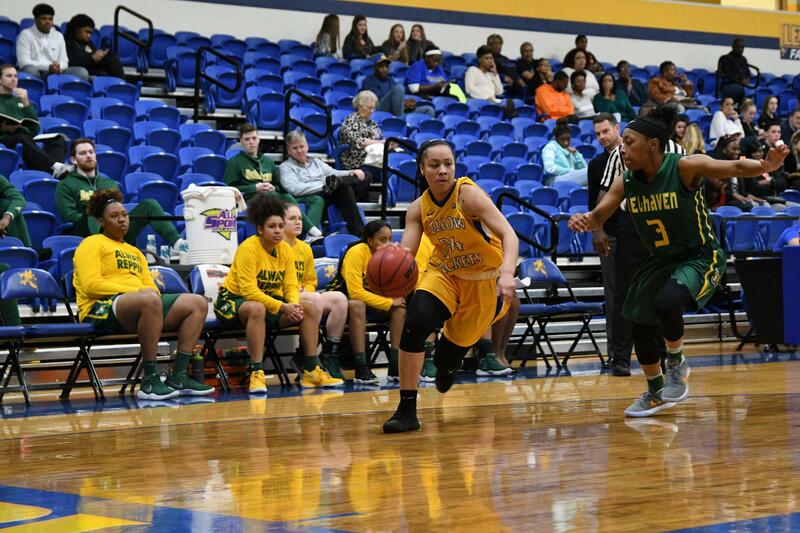 Keauna Whitfield and Faith Hudson each hauled in a team-high of seven rebounds, while Whitfield also led LETU with three assists. Shooting percentage proved to be a dagger for the YellowJackets as they shot only 28.6 percent (18-63) from the field while hitting just 8-of-15 (53.3 percent) of their free throws. Millsaps managed to fare much better on the day, connecting on 44.9 percent (22-49) of their shots from the field to overcome a 2-of-16 (12.5 percent) mark from beyond the arc. LeTourneau will look to redeem themselves as they open ASC on the road at Concordia Texas in Austin, Texas on Thursday, November 29 at 5:30 p.m. The Tornados will enter Thursday’s conference opener coming off a pair of weekend losses to run their record to 1-4 overall record. 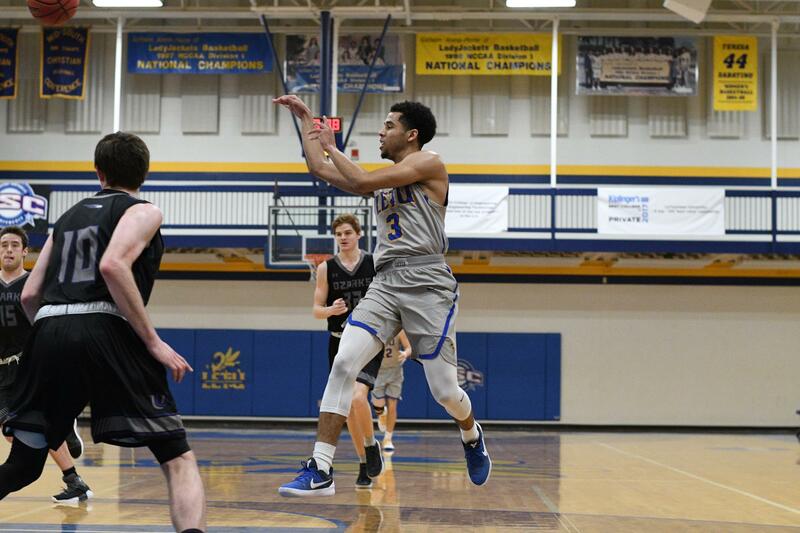 LONGVIEW, Texas – Battling through six ties and 12 lead changes, the LeTourneau University men’s basketball team would see a 48-point second half from visiting Wheaton College prove to be the difference in an 89-87 defeat at Solheim Arena on Saturday, November 24. The loss drops LETU to a .500 record of 3-3 overall while the Thunder stayed perfect and improved to 5-0 on the season. A frenetic pace would happen from the opening tip, with 13 points scored in the opening 66 seconds of the game as the YellowJackets jumped out to an 8-5 lead thanks in part to back-to-back threes. With LeTourneau doubling up Wheaton 10-5 at the 17:45 mark, the Thunder would use a 6-0 run to claim their first lead since the opening bucket of the game before seeing junior Nate West respond with a fast-break layup to put LETU back up 12-11. First-half lead changes would continue with neither team able to open a lead of more than seven as a 7-0 Thunder run gave Wheaton their largest lead of the half at 25-18 with 10:32 left in the first half. Managing to keep within two possessions for the next three minutes of action, LETU would break through with a 9-1 run to claim a one-point lead at 36-35 before seeing Wheaton tie things at 38-38 heading into the final 2:41 of the first period. In the final two-plus minutes, the YellowJackets would score eight of the last 11 points and take their largest lead of the game at 46-39 to hold a 46-41 lead at the break. A three-point shooting contest would break out in the opening minutes of the second half as four of the first six made field goals would come from beyond the arc. After an Aston Francis triple would cut the LETU lead to 52-51 with 16:26 remaining, a two-minute scoring drought would ensue before four-straight free throws by the Thunder would put LETU in a 55-52 hole with 13:30 remaining. Wheaton would then grow their lead back out to seven and match LeTourneau basket-for-basket, using another Francis three to go up 72-64 with 6:23 left before seeing West respond with a three of his own just 14 seconds later. Back-to-back layups for LETU would bring the YellowJackets within one as the game would set up to be a tight one down the stretch with free throw shooting looking to determine the outcome. It would be Wheaton who would be the aggressor and manage to go to the line, connecting on 9-of-11 free throws in the final 7:36 to hold off the YellowJackets as West would hit two threes’ in the last three seconds which included a 40-foot buzzer beater to settle for the two-point defeat. West led the YellowJackets with a career-high 33 points while going 7-for-19 from behind the arc, but would be outdueled by Francis who scored a game-high 42 points which included five triples. Moore finished with a double-double scoring 20 points and grabbing a team-high 12 rebounds while Seth Mattson added seven points and five rebounds. Wheaton shot 46.0 percent from the field while the YellowJackets managed to hit just 29-of-79 shots (36.7 percent) with 13 of the 29 shots coming as threes. The Thunder used turnovers to their advantage as they scored 20 points off 19 LeTourneau turnovers while allowing just 12 points to LETU off 15 Wheaton turnovers. The YellowJackets will look to bounce back as they hit the road to open American Southwest Conference play in Austin, Texas when they take on Concordia Texas on Thursday, November 29 at 7:30 p.m. CTX will be looking to right the ship, as the Tornadoes will enter Thursday’s game with a 1-4 overall record. Concordia’s lone win of the season was a 117-90 thrashing of Willamette University on November 16. JACKSON, Miss. – Falling behind 14-6 at the end of the first quarter, the LeTourneau University women’s basketball team would be unable to overcome a 28-16 halftime deficit in a 53-42 neutral-site defeat to Birmingham-Southern University in the 2018 Millsaps Thanksgiving Classic at the Hangar Dome in Jackson, Mississippi on Saturday, November 24. LeTourneau is now 1-2 overall this season while the Panthers picked up their first win of the season to improve to 3-1 overall. The defense for both squads shined in the opening minutes of the game as points would prove hard to come by for a majority of the first quarter. Trailing 7-3 with 7:03 left in the opening period, the YellowJackets would trade free throws with BSC as the game would go 5:23 without a made field goal before an Alexandria Throne layup pulled LETU within two at 8-6. The basket would prove to be the last field goal of the quarter for LeTourneau as a 6-0 run for Birmingham-Southern gave the Panthers a 14-6 lead. Plagued by a slow start to the opening of the second quarter, LETU would see BSC go up 21-8 with 7:21 left in the first half, ending the 7-2 run after Keauna Whitfield would knock down a jump shot 21 seconds later. The Birmingham-Southern lead would grow to as many as 15 at 25-10, but the YellowJackets would manage to double up the Panthers 6-3 in the final four minutes of the half to trail 28-16 at halftime. Needing to find a spark to be able to get back into the game, LETU would be unable to cut into the lead out of the halftime break as Birmingham-Southern used a 9-0 run to break the game open and take their largest lead of the game at 42-20. Down but not out, LeTourneau responded by scoring the final 11 points of the third quarter which started with a Whitfield triple as the lead would be cut to just 11 at 42-31. Neither team would be able to match their third quarter scoring output as the first four minutes of the fourth period would go scoreless before Sha’Donnaver Young pulled LETU back within single-digits at 42-33. Despite multiple efforts from LeTourneau to cut into the Panther lead any more, Birmingham-Southern would manage to hit timely shots and hold the YellowJackets at bay to come away with the victory. LETU would start the game just 5-for-22 from the field, scoring five of their 16 first-half points from the charity stripe. Adding to the shooting woes in the game for the YellowJackets was a 3-of-19 performance from beyond the arc, with two of the three triples coming in the second half. A 19-12 advantage in points off turnovers would spark the Panthers, who would force 22 LeTourneau turnovers while being guilty of 17 turnovers of their own. Young would manage to be LETU’s only player in double-digits, finishing with 10 points while Olivia Eweni and Whitfield each had nine points. LeTourneau will look to bounce back tomorrow afternoon when they close out the Millsaps Thanksgiving Classic with a 3:00 p.m. game against the host Majors. Millsaps is scheduled to play Howard Payne University at 3:00 p.m. on Saturday afternoon. In last year’s meeting at the 2017 Millsaps Thanksgiving Classic, LETU pulled out a 70-63 win by outscoring Millsaps 22-14 in the fourth quarter.